This week sees some exciting steps forward in opening up useful data that support our understanding of rivers and providing data that local groups interested in topics such as flood management and pollution control can access. This week we should see the beta release of Ordnance Survey’s new OS OpenMap Water; a generalised (simplified) network dataset covering Great Britain's rivers which will provide a national view of our watercourses. I’m personally excited to see this dataset as there has been a long history of river datasets within the UK and a keen interest in having an open dataset that can be used to carry out some basic network analytics by many of the organisations we work with. Also on Tuesday the Environment Agency will pull the cover’s off the beta of their new real time flood warnings, alerts and river levels api at environment.data.gov.uk This is a rich api service with lots of potential for innovative queries and visualisations. It is a great step for the Environment Agency in maximising the use of their data providing the ability to access archive dumps of the data if you want to research the history. More and more Copernicus Earth Observation (EO) data is becoming available. The Space Applications Catapult has updated its Data Discovery Hub to aid finding some of this rich set of EO data. Last Friday the Digital Catapult launched their Environmental Data Exchange, with a variety of datasets highlighted during the launch hack weekend (#edxhack) including the Oxford Flood Network and their soon to be released api. I’m looking forward to exploring the potential as to how this data can be used together. There are lots of opportunities to make interesting investigations into the river environment and to visualise aspects in ways that we haven't thought of. Please tell us what you find, and show us what you produce. Implementing Open Data has been both an opportunity and a challenge for us but we have made big steps. The Environment Agency’s Data Advisory Group has been active in supporting the Environment Agency’s prioritisation of data for release. After the last meeting it was announced that a business case will be explored for the release of the EA’s Lidar (accurate elevation data) as open data which could really add an extra dimension to local river applications. Defra is currently exploring how we can expand the lessons and experience of the advisory group to the whole network. 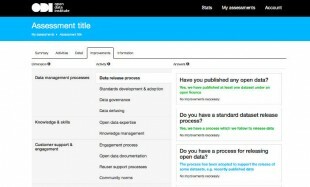 Alongside this our partnership project with the Open Data Institute (ODI) will see the launch of the organisational open data maturity model in the coming weeks. Open Data & Transparency... How do you make it happen?